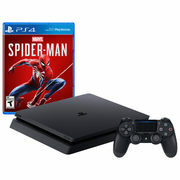 PlayStation 4 1TB Spider-Man Bundle $380 + More! Dell Dell Super Sale: Inspiron 15 5000 Laptop $800, PlayStation 4 1TB Spider-Man Bundle $380, Seagate 4TB Backup Plus Hub $120 + More PlayStation 4 1TB Spider-Man Bundle $380 + More! It's a super time to head over to Dell, because they're holding a Super Sale and you can take up to 40% off select Dell desktops, laptops and other electronics! We've listed a few of the deals available along with some coupon codes to help get you started. The Dell Super Sale is effective until February 15 at 6:00 AM ET. Quantities are limited, so shop quickly if you have your eye on an item! Dell.ca offers free shipping on all orders with no minimum purchase.